Sondre Sanden Tørdal and Philipp Schubert are among the PhD candidates who use the motion-laboratory at UiA in their research work and when working on problems relevant for industry. 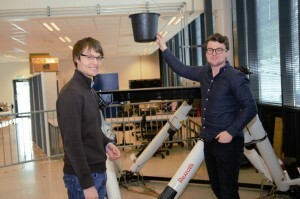 For two weeks the PhD candidates Sondre Sanden Tørdal (UiA) and Philipp Schubert (RWTH Achen) have worked intensively in UiAs Motion Lab at Campus Grimstad, before Schubert returned to Achen. The solution the PhD candidates are developing can very likely become integrated in a future product for one or more of the partner companies in the research centre SFI Offshore Mechatronics. 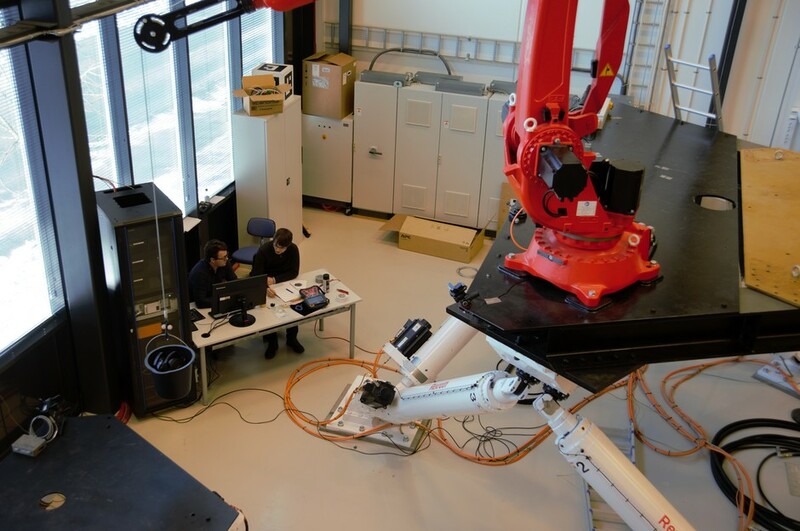 The centre for research-driven innovation, SFI Offshore Mechatronics, works on developing tools and methods which are relevant for industry. The centre leader Geir Hovland sees a large value in this type of cooperation. – It results in benefits at several levels. The PhD candidates get to exchange ideas and experiences, UiA gets a joint publication with RWTH Achen, and the industry gets to see the potensial in a potential new product, says Hovland. The aim with the study is to dampen out oscillations in a swinging load in a crane because this can increase the so-called weather window when transfering loads between two vessels in offshore operations. Swinging loads is one of several problems which need to be researched to meet a future with increased leves of autonomous offshore operations. Solutions for damping out oscillations in loads can, in addition to increasing the weather window, also increase safety and efficiency. 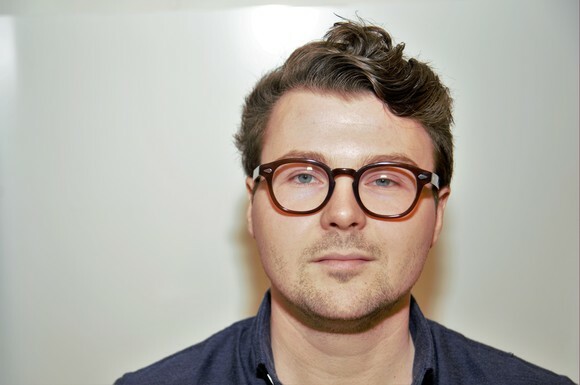 Sondre Tørdal, who also holds a 20% position in the SFI partner company MacGregor in parallel with his PhD studies, hopes to see the developed solution in a future product one day. – The research which is done here has a direct transfer value for the industry. They can potentially make use of the research and develop products where the developed technology could be incorporated, he says. 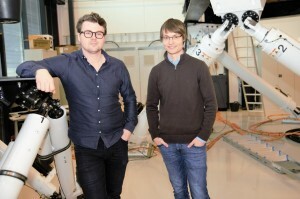 Tørdal and Schubert are both PhD candidates through the SFI. The plan, as a first step, a joint publication based on this work – and see possibilities for future collaboration afterwards. Geir Hovland would like to see more of this type of collaboration, both with international and Norwegian partners. The Motion Laboratory at UiA is unique in the academic world, and consists of among other equipment two Stewart platforms which are used to simulate ship motions. I additions to these machines, we have an industrial robot with an open controller and advanced measurement equipment based on laser and camera technologies. 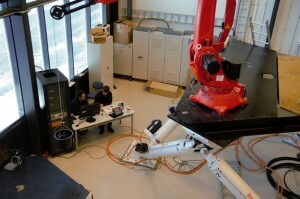 The robot is currently used to simulate a crane mounted on a vessel. The laboratory was opened at the end of 2013 with the goal of increased collaboration between UiA and industry. 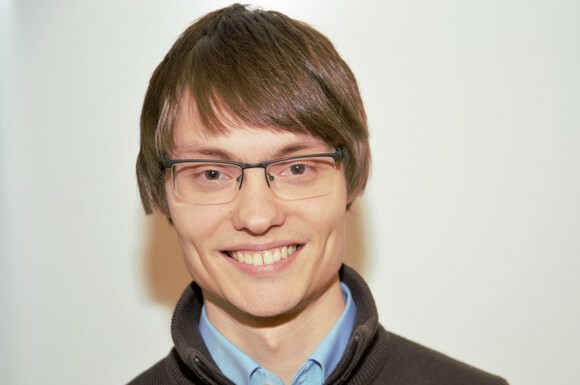 Phillipp Schubert has visited UiAs Motion Lab before and has looked forward to working here. – What is cool with this system is that “real” data is used, not only data from a simulation, and I think the companies see this as more “authentic”. Here you have a truly unique test facility which can give you more realistic parameters for your study compared to simulations only. The experiments and measurements we do are perhaps the closest we could do compared to an actual implementation on two vessels. – If you want to the motion compensation experiments this is the place to do it. We have a unique test facility and we are working on realistic constraints. In a simulation a mathematical model is used to simulate the problem. This model is then used to develop potential solutions to the problem. In other words, the solution will often match well with what has been simulated, but you will normally not be able to include all realistic parameters in your model compared to data from the test facility. And the missing of some realistic parameters may affect the results in your study. Strengthening of our international networks is a significant priority in UiAs strategy for 2016-2020, and increased mobility of our PhD candidates is one of the concrete measures which we encourage. RWTH Aachen participates in SFI Offshore Mechatronics with two institutes. Philipp Schubert is satisfied with the research stay in Grimstad and encourages others to do the same.